The Trainer Challenge was held October 29-31 in Doswell, VA. Leisha is an accomplished horsewoman, with a long history in ranching and rodeo. She specializes in barrel racing, equitation, and performance horses. Her passion is not only to continue her development as a student of the horse, but to share her knowledge and enthusiasm with others. 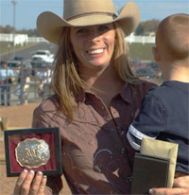 Leisha is an insightful, entertaining, inspirational clinician and horsemanship instructor.